Attended by world-renowned chefs, prominent hoteliers and restaurateurs, hospitality gurus and key media, and with a celebrity host, the AA Hospitality Awards, held at the Grosvenor House Hotel is a highlight in the industry calendar. Over the course of the evening, the event recognises and rewards the excellent services provided by our very best establishments, in addition to acting as the initial high-profile launch of the latest editions of the AA’s range of lifestyle guides. The AA Hotel of the Year Award was introduced in 1992, and is the AA’s ultimate accolade for hotels in the UK. It is awarded to hotels that are recognised as being outstanding examples in their particular market. From the small family-run hotel to the most ambitious commercial ventures, hotels of every size and style are potential winners. 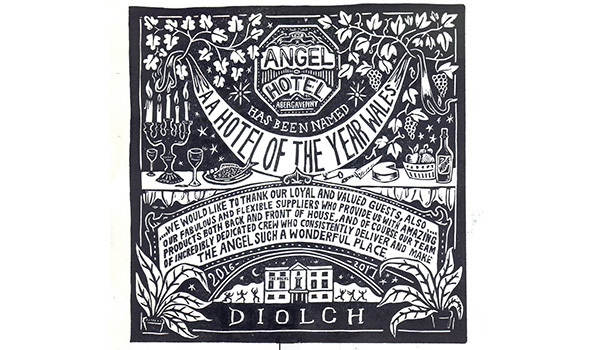 Situated in the heart of the bustling market town of Abergavenny, the Angel Hotel was established as a coaching inn on the road between London and Fishguard in the 18th Century. Over the years, the hotel has seen many changes in ownership, each of which put its own stamp on the grand Georgian building. In 2002, the hotel was taken over by a local family who have spent the last 14 years carefully and lovingly bringing the tired old building back to its former glory, whilst creating a contemporary and distinctive identity. The residents of Abergavenny have seen the hotel transform into a bright, elegant hub, very much in the center of community. All public areas and guestrooms have been stylishly renovated and the hotel now encompasses many beautiful areas, where people come regularly, to enjoy a meal, drink or stay. The level of Food & Beverage trade through the bar, afternoon tea room and restaurant has gone from strength to strength and is now a huge component of the business. How do they feel about winning?